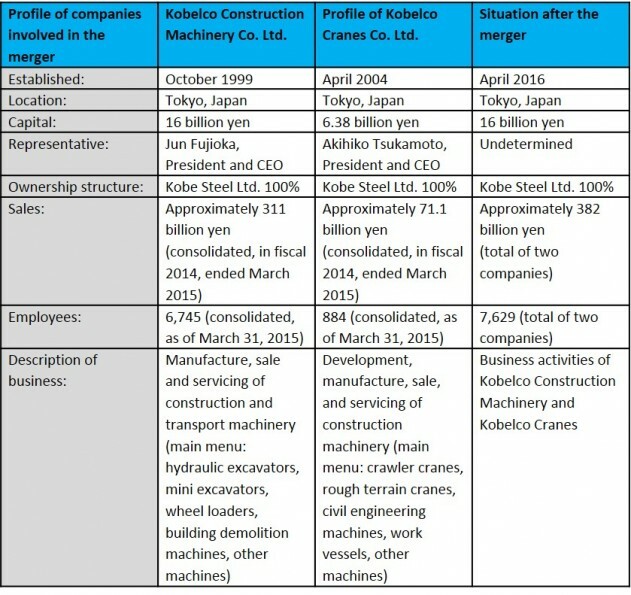 Kobelco Construction Machinery and Kobelco Cranes to merge in Japan - Kobelco Construction Machinery Europe B.V.
Kobe Steel Ltd. and its wholly owned subsidiaries, Kobelco Construction Machinery Co. Ltd. and Kobelco Cranes Co. Ltd., reached a decision in late 2015 to merge the businesses of Kobelco Construction Machinery and Kobelco Cranes together. From development to procurement, manufacturing, quality and sales, the organisation and business will be reviewed. Combining and rearranging common operations will increase business efficiency, while the effective utilisation of management resources will strengthen management. It will also enable Kobe Steel to pursue new possibilities from the synergy derived from the accumulated technologies of its excavators and cranes. The new company aims to take a new leap forward as a comprehensive construction machinery manufacturer that combines the two product menus of excavators and cranes. As the merger will take place between two wholly owned consolidated subsidiaries, Kobe Steel anticipates that it will have an insignificant impact on its consolidated results. Machinery Europe Ltd. And Kobelco Cranes Europe will retain their independence.